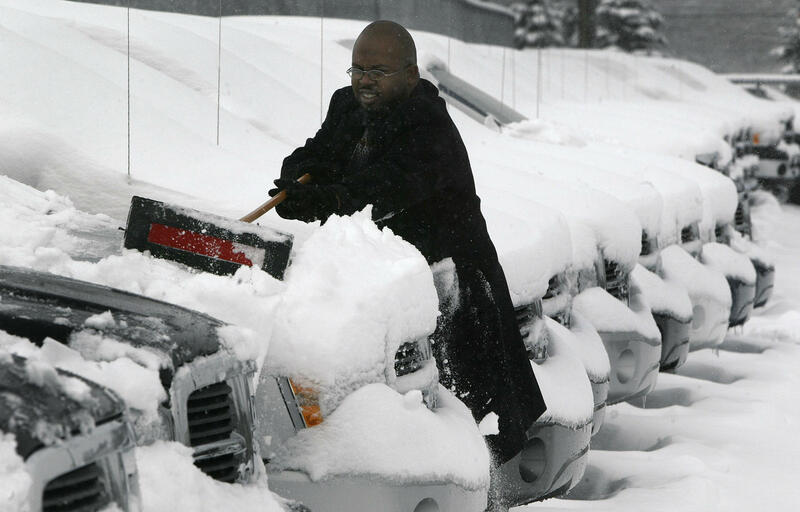 Ernest Bolden clears snow off cars on a sales lot in Detroit in March 2005. Global warming is likely to bring more snow to Michigan, but only for the next few decades. That’s because the Great Lakes are spending fewer days under ice cover. Without the ice, it’s easier for surface water to evaporate and turn into lake effect snow. But Western Michigan University biologist Dave Karowe says the trend won’t continue forever. He says snow will become increasingly rare in Michigan after 2060, unless people slow climate change down. “By the end of the century, the last 20 years of the century, the prediction is that instead of 50 to 70 percent snow we’ll have around 10 percent snow. So 90 percent of our winter precipitation will be rain,” he said. “In the short run, though, it’s likely that we’ll get more lake effect snow,” he added. In 80 years, Karowe says, Michigan’s climate is likely to resemble southern Oklahoma’s today if people don’t swiftly move away from fossil fuels. Karowe says the current rate of global warming will eventually put tremendous stress on Michigan’s wildlife. Karowe says the state could power itself with solar and wind today if it embraced those sources of energy. PFAS compounds have turned up in the soil and groundwater in several parts of Michigan. Researchers want to know how far the chemicals will spread and how quickly they will move. It's one of several topics likely to be discussed at a meeting on PFAS research at Western Michigan University on Thursday. Flooding is still plaguing some parts of Kalamazoo County. Areas of Mattawan, Portage and Texas Township have had exceptionally high groundwater for months. That’s flooded basements and forced the closure of a few roads. A Galesburg City Council meeting drew a crowd on Thursday as officials discussed the potential sale of oil and mineral rights in a local park. Savoy Energy LP, a Traverse City-based company, has requested a non-developmental lease on 22 acres of parkland behind city hall. What Would You Like To Know About Climate Change? Share your thoughts and questions about global warming's local impact with WMUK's news team.